You don't want to miss the Pahiyas Festival this year, 2019, do you? Lucban is considered a third class municipality in the province of Quezon, the Philippines. This town is made popular and associated with Pahiyas Festival. It is situated at the foot of Mount Banahaw de Lucban and approximately 26 kilometres from Lucena City and 160 kilometres from Manila via this city. My latest visit in Lucban became memorable not only because of the festival, the food, and the like, but because of the warm reception of a family whom we met for the first time. Their gestures are full of sincerity. The family has a huge house, yet, simple and humble. If your travelling includes meeting local people, Lucban is the place for you and Lucbanins are the people you have to meet. No matter how many pictures I take of the old Lucban church, all of them have a trace of its old age. In the Year 1595, the first church was built but was ruined in the Year 1629. The following year, the second church was constructed in a span of ten years. The church was destroyed by a fire in the Year 1733. The third church was not built until after five years. The interior of the old church reminds me of the other few old churches in the Philippines which is equally interesting. Come see this old church. It is worth a visit! I was so excited when I finally made it to the Pahiyas Festival. The festival is being held annually on the 15th of May and celebrated as a thanksgiving to San Isidro Labrador, the Patron Saint of the Farmers, for the agricultural harvests. Artworks are displayed in houses of selected streets. 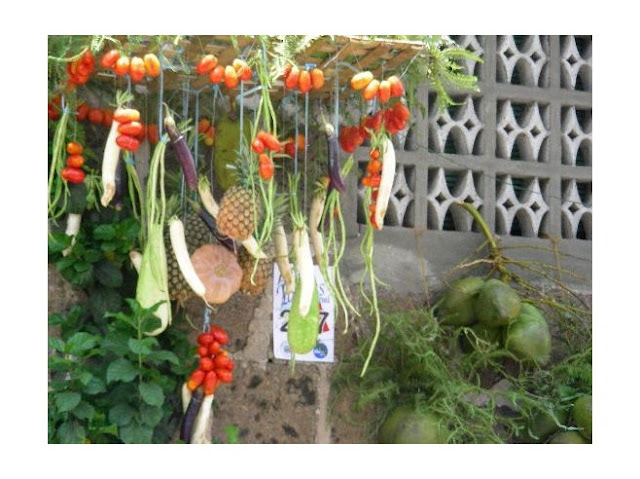 A bountiful display of fruits, vegetables, and all kinds of farm produce including the famous kiping, rice cakes, rice grains, native lanterns, beautiful flowers and ferns. 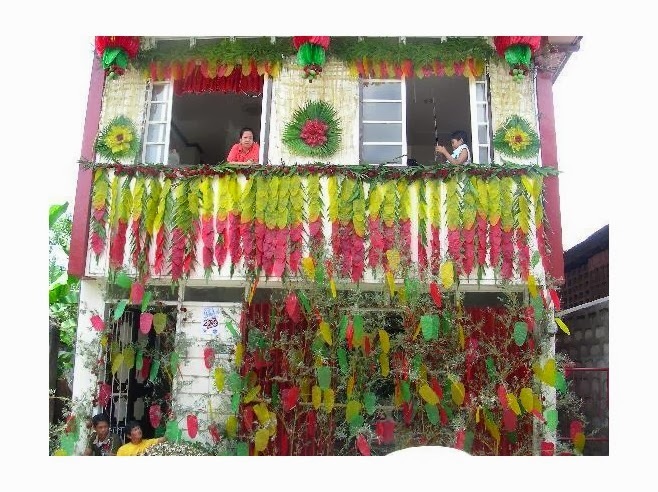 Early morning is the best time to watch the Pahiyas decoration as there are very few people watching and roaming the Pahiyas route and you can see the houses and take pictures in full view. The feast is held for a week which attracted local and foreign tourists. 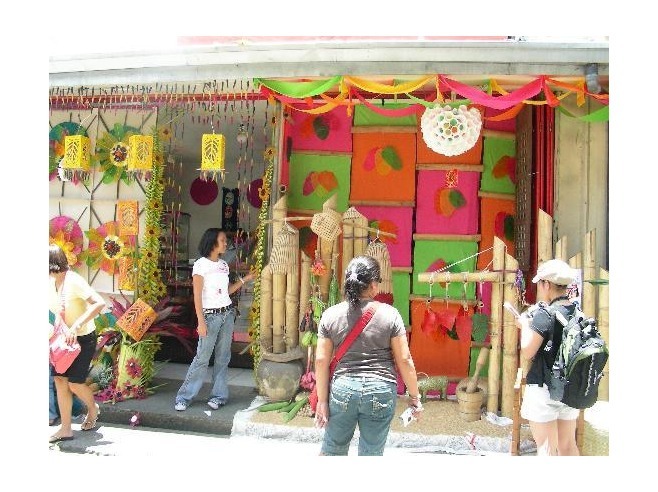 The popularity of Pahiyas festival has contributed to the progressive tourism industry of Lucban, Quezon. I highly recommend a visit to the festival. Stay in Lucban for a day or two to fully enjoy the celebration. Experience the colours, sights and food at the San Isidro Labrador ~ Pahiyas Festival. Local and foreign tourist have started visiting the site. The huge statue of Jesus Christ is on top of the hill. You will be climbing 292 steps to be able to reach the statue that can be seen many miles away. 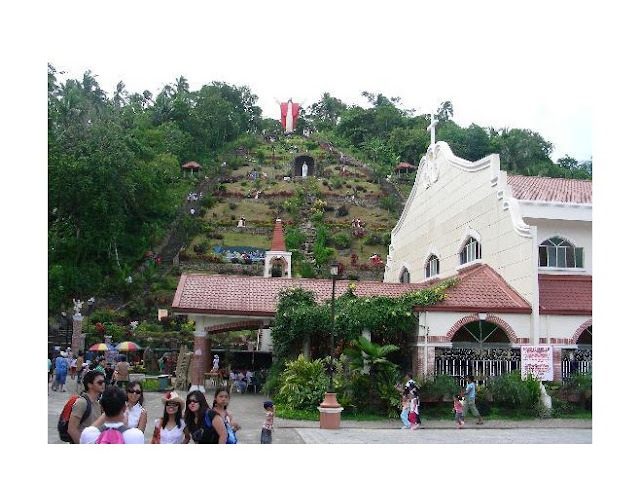 Before reaching the top, you will be passing (while climbing) the statues of the 14 Stations of the Cross. You will also be delighted with the life-size carving of the Last Supper. Before you decide to go up the steep mountain, you may want to visit the church right at the foot of the hill. There is a healing mass that is held on Mondays and Saturdays. If you are on top of the hill beside the statue of Jesus, you will have a chance to see the view of the town of Lucban and its green landscape. It is a refreshing feeling. This is one of those experiences that I will never forget. I just hope you can make it to the top. Yes, you can do it, but just a piece of advice. Take it easy going up the steps especially during the hot or warm season. Take your time and bring drinking water. During my last visit, I have witnessed a couple of visitors who fainted due to the hot weather and tiredness when they reached the top. The mountain steps are steep that you need rest at some point. Take care of yourself. If you feel dizzy, stop and take a rest. You will find NO First Aid Kit. I hope the municipality will realize that there is a need for this. It is a must! You will never feel hungry in Lucban especially during the Pahiyas festival. Aside from the abundance of local delicacies, there are small 'eateries' or 'resto' in and around the town. Expect typical Filipino food like Laing, Longganisa (Pork Sausage), Barbecue, and many other recipe with beef and chicken prepared Pinoy (Filipino) style with coconut milk. There are also mouth-watering desserts for you to choose from. The only dish I did not remember to order is the famous Pancit Habhab. This noodle is mixed with meat, seafood, and vegetable. The only difference with other pancit (noodle) is the way the local people eat it. Pancit is wrapped and rolled loosely in banana leaf, locked at one end and push to the other end and eat directly. No spoon and fork are used ~ not even a knife. If you want to experience this unusual way of eating Pancit Habhab, then come visit Lucban. The Longganisa is so tasty. The local people knows how to mix my favourite. It is best combined with Laing and Plain Rice. 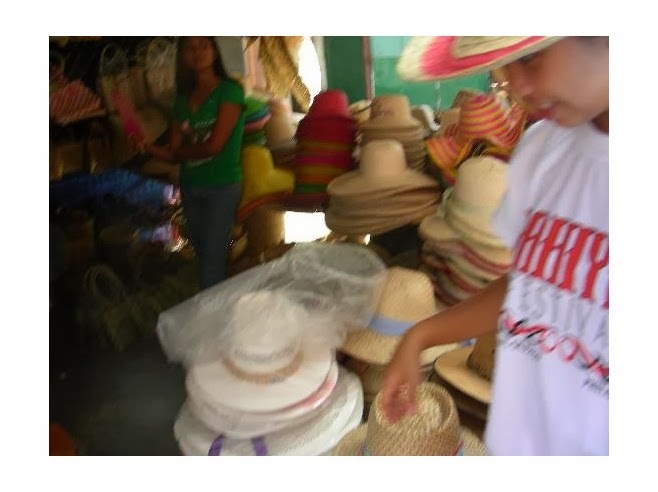 A well known native food (pasalubong) store in Lucban is Eker & Ely Pride of Lucban Pasalubong. They were able to build a good reputation since they first opened in 1958. Buy Broas, Piaya, Peanut Brittle and many more delicacies that can be found only in this town. But the one thing you should not forget is to buy their special longganisa. The store sells by the dozens. Try this store and have a taste of Lucban. 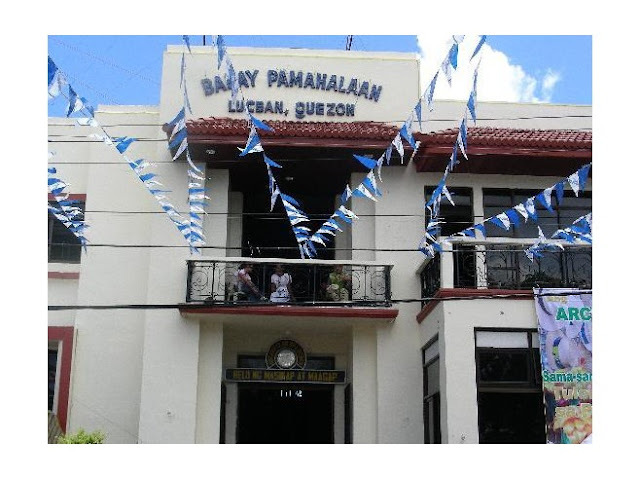 The Municipal building of Lucban is situated at the main road which is Quezon Boulevard. A busy street leading to the town proper. Most of the celebration and festivals, including the popular Pahiyas is being organized and coordinated with the municipality. Just like any other street in the Philippines, most streets of Lucban are narrow and congested. Bigger to small streets are full of jeepneys, tricycle, buses and private cars, not to mention the normal way of local people's travelling....by walking along the road. You will enjoy walking though as you will have a glimpse of the houses and simple life of the Lucbanins. Although I did not use public transport when I last visited Lucban, I can see a lot of tricyle plying on the streets. This transport is very common anywhere in the Philippines servicing small streets in towns, cities, and provinces. If you are a tourist from other country, I recommend that you take a tricycle for short distance trip. It is a safe vehicle provided you are travelling in small streets within the community. Come along, let us take a tricyle and explore the beauty of this historical town. Another safe means of public transport in Lucban is their very own Jeep. You will see and experience Jeep only in the Philippines, in its towns, cities, and provinces all over the country. If you are visiting Lucban, take a jeepney for long distances within the municipality and the neighbouring towns. It is fast at times but safe considering the fact that I used its services half of my life. Take a look at the picture of my Jeep in Lucban. This is a bigger version. The normal size of this is a 15-seater including the driver. The jeep in the picture would accommodate at least a little more than twenty passengers. 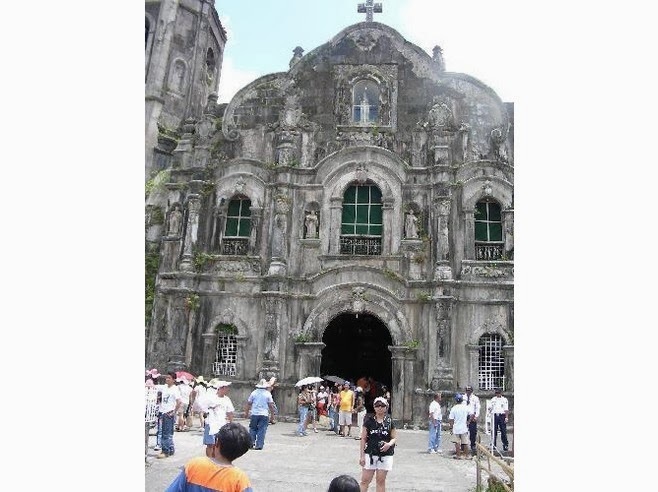 There is so much to say about Lucban some of which I have written in other websites. Come visit Lucban. Enjoy the festival, the food, the pilgrimage, and the local people. It's more fun in this part of the Philippines. It's more fun in Pahiyas 2019! Thanks Myrnz for reading my blog about Pahiyas and for finding time to comment. This is an event that most of us, Filipinos, should not miss visiting. I enjoyed my whole day celebrating this festivities. Don't miss this event, it is worth seeing. Looking forward to receiving your feedback after the festival.